Twelve teams from universities in six countries on three continents are scheduled to meet in July 2014 to take part in the second biennial European International Submarine Races (eISR) at QinetiQ’s Ocean Basin in Gosport, U.K., the biggest covered water space in Europe. This week-long event from July 7-11, 2014, is a unique sporting and engineering challenge which tests the students’ engineering skills. 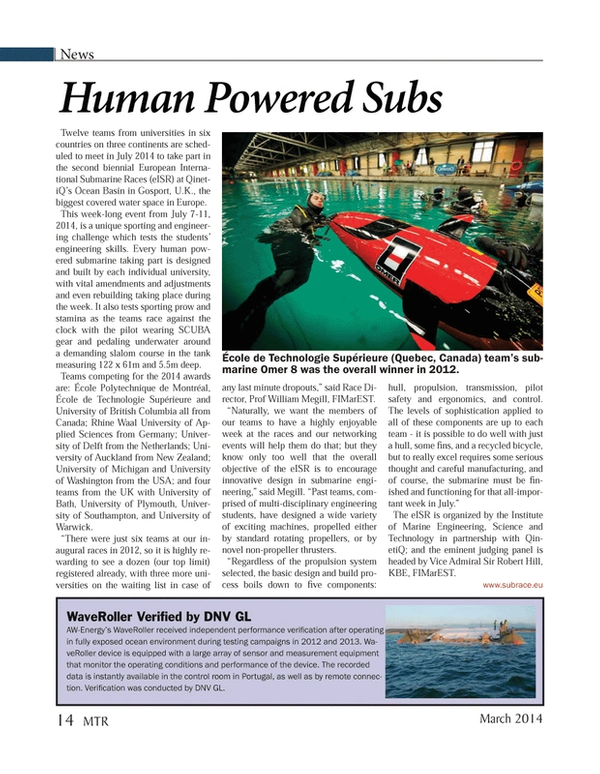 Every human powered submarine taking part is designed and built by each individual university, with vital amendments and adjustments and even rebuilding taking place during the week. It also tests sporting prow and stamina as the teams race against the clock with the pilot wearing SCUBA gear and pedaling underwater around a demanding slalom course in the tank measuring 122 x 61m and 5.5m deep. “There were just six teams at our inaugural races in 2012, so it is highly rewarding to see a dozen (our top limit) registered already, with three more universities on the waiting list in case of any last minute dropouts,” said Race Director, Prof William Megill, FIMarEST. “Naturally, we want the members of our teams to have a highly enjoyable week at the races and our networking events will help them do that; but they know only too well that the overall objective of the eISR is to encourage innovative design in submarine engineering,” said Megill. “Past teams, comprised of multi-disciplinary engineering students, have designed a wide variety of exciting machines, propelled either by standard rotating propellers, or by novel non-propeller thrusters. The eISR is organized by the Institute of Marine Engineering, Science and Technology in partnership with QinetiQ; and the eminent judging panel is headed by Vice Admiral Sir Robert Hill, KBE, FIMarEST.